ROYBAL-ALLARD, Lucille, (daughter of Edward R. Roybal), a Representative from California; born in Boyle Heights, Los Angeles County, Calif., June 12, 1941; graduated from Ramona Convent Secondary School, Alhambra, Calif., 1959; B.A., California State University, Los Angeles, Calif., 1965; community relations and nonprofit executive; member of the California state assembly, 1987-1992; elected as a Democrat to the One Hundred Third and to the thirteen succeeding Congresses (January 3, 1993-present). Papers: 1987-1988, 4 cubic feet. The collection contains bill files, correspondence, invitations, and schedules of Lucille Roybal-Allard from her tenure in the California state assembly..
Papers: 1989-1990, 1 cubic foot. The office files of Lucille Roybal-Allard contain chronological correspondence and schedules for appearances from her tenure in the California State Assembly. 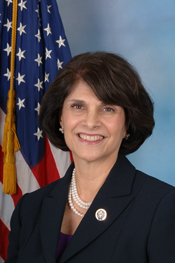 "Lucille Roybal-Allard" in Hispanic Americans in Congress, 1822-2012. Prepared under the direction of the Committee on House Administration by the Office of the Historian and the Office of the Clerk, U.S. House of Representatives. Washington: Government Printing Office, 2013. "Lucille Roybal-Allard" in Women in Congress, 1917-2006. Prepared under the direction of the Committee on House Administration by the Office of History & Preservation, U. S. House of Representatives. Washington: Government Printing Office, 2006.